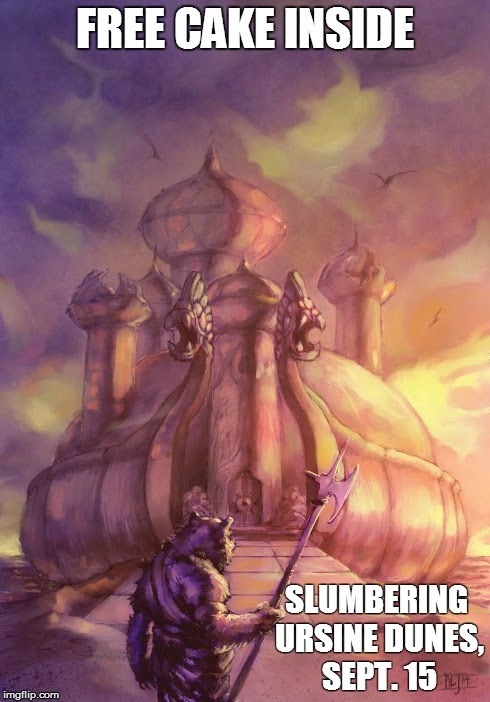 The Slumbering Ursine Dunes is only going to be available for a few more hours. Honestly I could go on and on about how great the material Chris has made for his long-running campaign is and how it has been one of the greatest D&D experiences of my life to play in it, but since time is short and I need you to read this quickly, I'd rather focus on something more of immediate interest to me: two more dungeons. If the kickstarter can just make a few more dollars, Chris will be producing two dungeons which have bedeviled and bamboozled us in the party for some time. They are the sinister Frog Demon Temple, whose deadliness has become a running joke in the campaign, and Bad Rajetz, whose mutable nature we have yet to solve after years of playtime. Plus Jason Sholtis of Dungeon Dozen and They Stalk The Underworld fame will be doing the art for them! I want to see them. I bet you want to see them, and if you pledge you can also get another of other great locales in addition to the Dunes. Go ahead, you know you want to.